The Spy Who Dumped Me (film, 2018). A 2018 American action comedy film with "R" rating by Lionsgate/Lions Gate Entertainment. Directed by Susanna Fogel. Official Trailer. The Spy Who Dumped Me is a 2018 American action comedy film directed by Susanna Fogel. 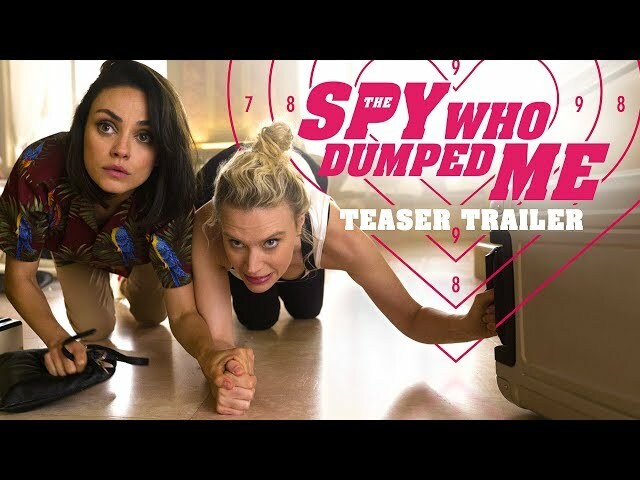 The Spy Who Dumped Me (2018 Movie) Official Trailer - Mila Kunis, Kate McKinnon, Sam Heughan. In Los Angeles, cashier Audrey Stockton spends her birthday upset after being dumped, via text, by her boyfriend Drew. Her best friend and roommate, Morgan, convinces her to burn Drew's things and sends him a text as a heads up. Unbeknownst to Audrey, Drew is a government agent being pursued by men trying to kill him. He promises to return and asks Audrey not to burn his things in the meantime. At her job, Audrey flirts with a man who asks her to walk him to his car. She is forced into a van. Inside, the man identifies himself as Sebastian Henshaw and that Drew works for the C.I.A. and has gone missing. Audrey claims not to have heard from Drew and is allowed to go home. Drew shows up to retrieve his possessions, including a fantasy football trophy. People begin shooting at them and Drew tells Audrey that, if anything happens to him, she must go to a certain café in Vienna and turn over the trophy to his contact. Drew is then murdered by a man Morgan had previously met at the bar, who is then pushed off the balcony by Morgan. Morgan convinces Audrey to go to Vienna. At the café, Sebastian appears and demands the trophy at gunpoint. Audrey reluctantly hands it over before the entire café is attacked. Audrey and Morgan flee, chased by men on motorcycles, but escape. Audrey reveals that she still has Drew's trophy since she switched it with one of several decoys they purchased. They board a train to Prague and discover that the trophy contains a USB flash drive. Morgan calls her parents, who tell her they can stay in Prague with Roger, a family friend. Principal photography began production in Budapest, Hungary in July 2017. The film The Spy Who Dumped Me was scheduled to be released by Lionsgate and Lions Gate Entertainment on August 3, 2018 (United States), on August 22, 2018 (United Kingdom) and on August 30, 2018 (Germany). The duration of the film is 117 minutes. With a budget of $40 million, the film grossed over $75.3 million. The Spy Who Dumped Me got average rating from critics. But the audience likes the film. Audiences polled by CinemaScore gave the film an average grade of "B" on a scale ranging from A+ to F.